In one of his trips to Libya a man named George arrived on a horse in a city paralyzed and overwhelmed with fear. A ferocious dragon settled in a nearby cave and demanded that every day the residents should sacrifice an innocent girl to quell his anger and prevent him from taking out his rage on the townspeople. The residents begged George to save them since the only girl left was the king's daughter who was destined to be sacrificed the following day. Equipped with spear and sword, St. George stood against the dragon and hit him with his spear, but the spear hit the hard armor of the dragon and was shattered. George was pushed under a magical orange tree which protected him from Marse the dragon. When realizing that he had to hit the dragon where no armor would protect him, he returned to fight against him, hit under his wing with his spear and killed him. George was named a Saint years after his death, when many stories and legends were associated with his name in numerous different versions, glorifying his heroism facing the dragon. The aforementioned story is, of course, just one of many whose main theme was killing a dragon and putting an end to sacrificing girls. His heroism and reputation caused many organizations and unions (such as archers, riders and scouts), Christian cities around the world (especially in Italy), and countries (including the UK) to announce him as their Patron. Richard the Lionheart, during a crusade led by him in the late 12th century to the Holy Land, placed his army under the protection and patronage of St. George. His sculptures and portraits adorn cities, churches, many flags and medals. And believe it or not, it is told that George was born in the city of Lod (Israel), which at that time was a Greek city called Lydda, and moreover – it is also said that after his death in 303 AD, he was buried there. In his name a church was established in Lod called St. George's Church. Hereby is the first connection to the Holy Land, Israel. The beginning of the sovereign story took place in 1489, under King Henry VII. At that time it was decided to set a value to the basic British currency - the pound, or as well known, the British Pound Sterling (GBP) – in a 23-carat gold coin (purity of .9583) weighing half an ounce (15.55 grams). Therefore the name of the coin with the King's face, known as the sovereign throughout the kingdom, was Sovereign (meaning ruler). On the back of the sovereign coin appears the famous Kingdom shield bearing symbols of countries (Royal Arms) under the rule of the United Kingdom at that time. Four parts can be found on the shield: three lions symbolizing England, a single lion symbolizing Scotland and a harp symbolizing Ireland. The shield can be found on some of the modern Sovereigns (from -1825 to 1874) and on later English coins, for example, a large proportion of single shilling coins or higher currencies (up to 5 shillings - Crown) in the period before the decimal reform in 1971. Another symbol of pure English pride of that time can be seen in the platform on which the shield is laid – the Tudor rose which was the symbol of the Royal Family that ruled during the Tudors kingdom between 1485 and -1603. The original Sovereign, with slight variations, has survived six kings (Henry VII, the famous Henry VIII, Edward VI, Queen Mary, Elizabeth I and James I) for 115 years. In 1604 the Sovereign was replaced by another equivalent –pound, the Unite, ("Union" to mark the union of England and Scotland into one kingdom), and then it waited quietly over two hundred years before it popped up again in 1817. In 1816, under the effect of the industrial revolution, the London mint shop was moved to its new location, where a steam driven compressor was first used. King George III thought it was a good opportunity to revive the days of the popular gold coin, the Sovereign, and renew its face. 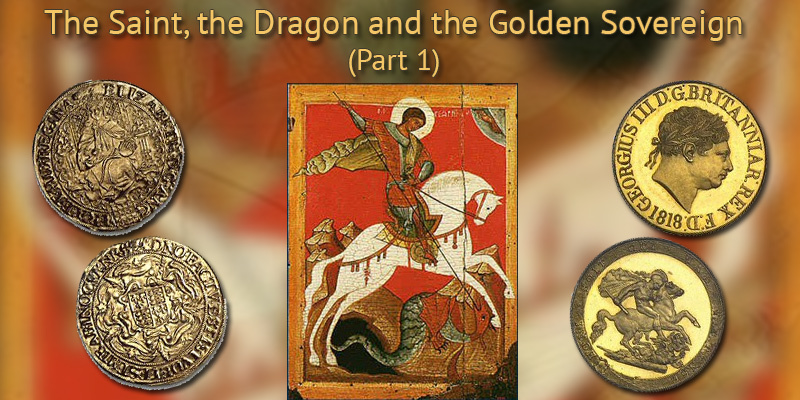 When the King's advisers tried to decide which character would glorify the back of the renewed currency, they remembered the folklore legends that had been prevalent throughout the kingdom for centuries regarding the fabulous deeds of St. George (no relation to the king ...) and his courageous victories defeating the evil dragon. The design task was entrusted to the famous Italian-born artist at the time, Benedetto Pistrucci. If we carefully scrutinize the coins we may often find below and on the right side of the base, where the dragon lies - the initials of the artist's name - BP. And so emerges the famous symbol, which adorns the Sovereign coins and other currencies from that year until today. 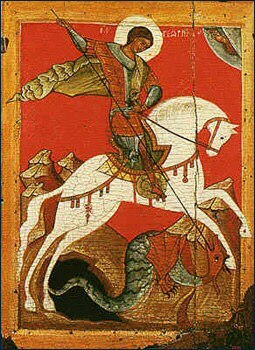 By the way, legend has it that the spear of St. George was named Ascalon, the name of the city of Ashkelon of the time, and so we can find a second connection to the Holy Land.